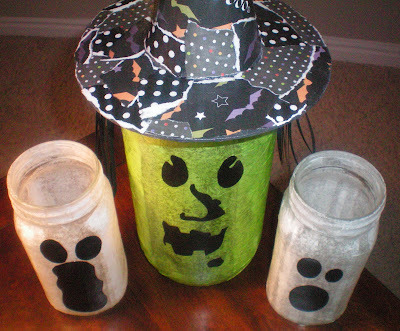 hi guys AN EARLY HALLOWEEN CRAFT to get you EXCITED FOR HALLOWEEN. (IS IT TO EARLY? NAH!!!!!) I made these last year with my sister! 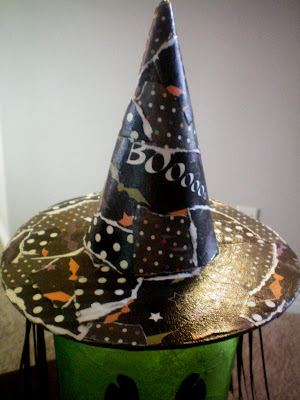 start with~ wItcH hat, green tissue paper, jar, mod podge, and sponge applicator…. BEFORE~ un-finished Take and cute tissue paper to size, then mod podged the strips on the OUTSIDE OF GLASS. Lay your strips of tissue paper over the mod podge and then add more mod podge over the tissue paper. 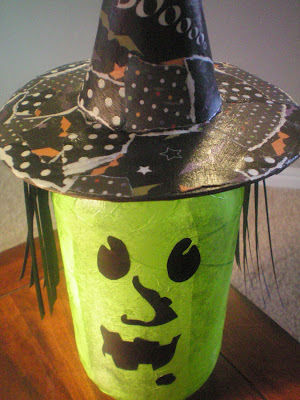 Next paint the hat with Acrylic paint (i used a charcoal color) then tear pieces of scrap paper in a Halloween theme, OF Course’! MOD PODGE AWAY… THEN pick glue off your fingers later… YEAH’ i AM IN kindergarten again! HA! Have your fab. 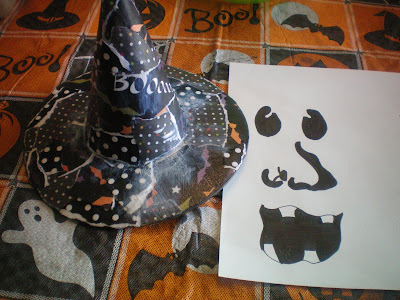 sis draw (or you draw) a witch template and cut it out on black paper, then mod podge the face on too. 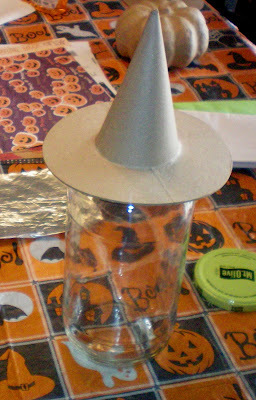 hot Glue hat to lid of jar, then glue black paper around the underneath of hat and cut strips from the black paper, for be-witching STRINGY LOOKING hair. Up close … THE WITCH! Here are my mod podged GHOSTS too! they are BOTH AFRAID OF THE WITCH, can you tell? When you are all done you drop your tea lights in them and let them “LIGHT UP” your walk ways or window panes. Nothing like a SPOOKTACULAR FLICKERING HALLOWEEN GLOW! 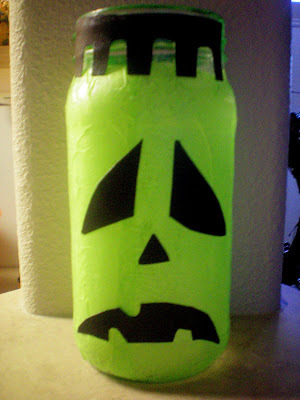 LASTLY, you can do jack O’ lantern jars too with orange tissue paper, I did those as well! my sis had the idea of MAKING MR. FRANK AS WELL! save those spaghetti, pickle, applesauce, and baby food jars (for the little babies in the fam.) HAPPY CRAFTING! 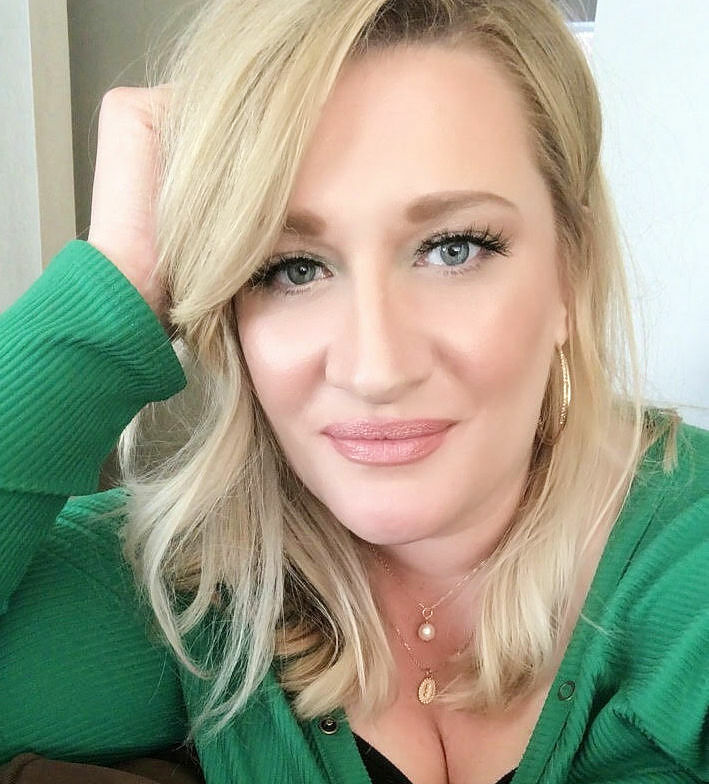 THANKS FOR STOPPING BY~ I HAVE TONS OF HALLOWEEN CRAFT IDEAS~ CAN’T wait to share them! I am linking up to Santas Gift Shoppe for Spotlight yourself Wednesday HERE Just Because I love it party at Tools Are For Woman HERE Strut Your Stuff at Somewhat Simple HERE Show off Your Stuff Party at Fireflies and Jellybeans HERE Show and Tell Friday at My Romantic Home HERE Feature yourself Friday at Fingerprints on the Fridge HERE lOOK at me Party at It’s Fun to Craft HERE Flaunt it Friday at Chic on a Shoestring HERE Show and Share Day at Just A Girl HERE Tatortots and jello for the Weekend Wrap Up Party HERE and Just Something I Whipped up at The Girl Creative HERE. love these!! Can’t wait to try it myself!! Love em!! 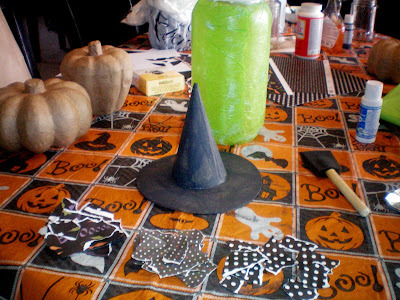 And no it is not too early for Halloween decor and crafts! Thanks for sharing! I love Halloween! These are a really cute head start on the season. I just have to ask…did you eat all the pickles from that jar?! 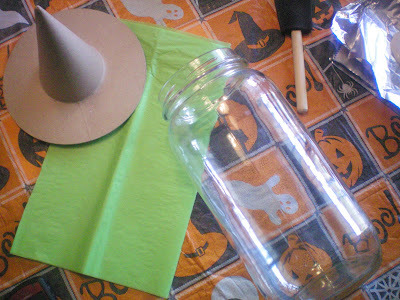 Oh goodie…I am so ready for some Halloween ideas since it takes me awhile to get things started. Heck August will be over in a snap and then we will start bringing out the fall stuff in Septemeber so keep posting something like this at least once a week if you don’t mind…I am so ready for it to hurry up. We are having a big Halloween Bash this year! 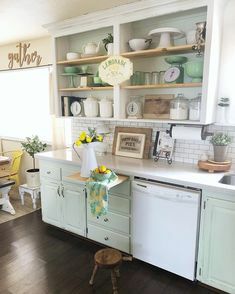 Cute jars and plan on making some like these…saw some last year so I bought the tissue paper at the end of the season and glad you reminded me to start saving jars. So cute! I am already starting on Halloween too! I can’t help myself, the dollar store had some really cute things last week! 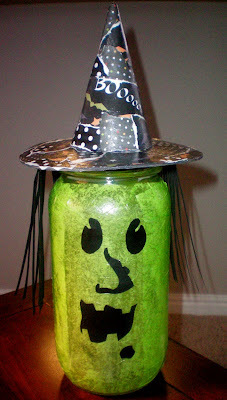 i ♥ halloween..so glad you are already posting ideas for decors! Golly, but these are cute! I am def putting them on my to do list. I knew I was saving those pasta sauce jars for a reason! So cute and soooo easy! 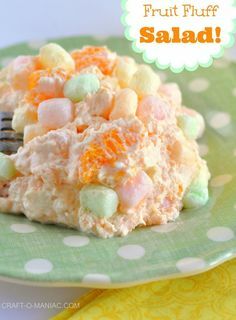 This is on my list of stuff to make. Thanks Jen! These are so cute! I definitely want to try them! I can not wait to do this project.. and I can not wait to dress up!!! so did you modge podge on the inside or out? these are really cool and im ready for a season change! I love these! I am so in the mood to do Halloween decorations too! I have already planned and few and have been scoping out for some more ideas! So thanks! These are so adorable!!!!! Thank you for sharing! What a great idea…thank you! I cant belive its time to start thinking about Halloween! really cute! the witch reminds me of the one in the great pumpkin charlie brown. very cute! I think it is great you are already up on the Halloween crafts! I found you through New Friend Friday. I will probably be stopping by again sometime! Already copied this idea into my evernote online notebook. Love it! 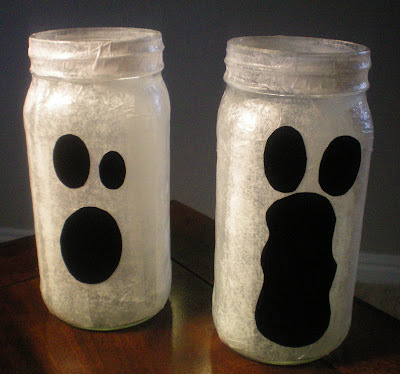 My kiddos will love making these. Stopping by from NFFRiday. You go girl! Gotta’ love Halloween ideas! These are too cute and I’m going to have to try these! I love these! 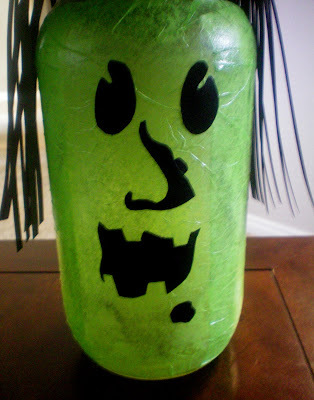 I am always on the lookout for fabulous Halloween decorations, and these I can make with my daughter, thanks! I love, love, LOVE Halloween. Just last week, I had a show n tell about the fireplace mantel halloween project of mine. And I say it’s never too early for celebrating and getting ready for that fun, fun day. 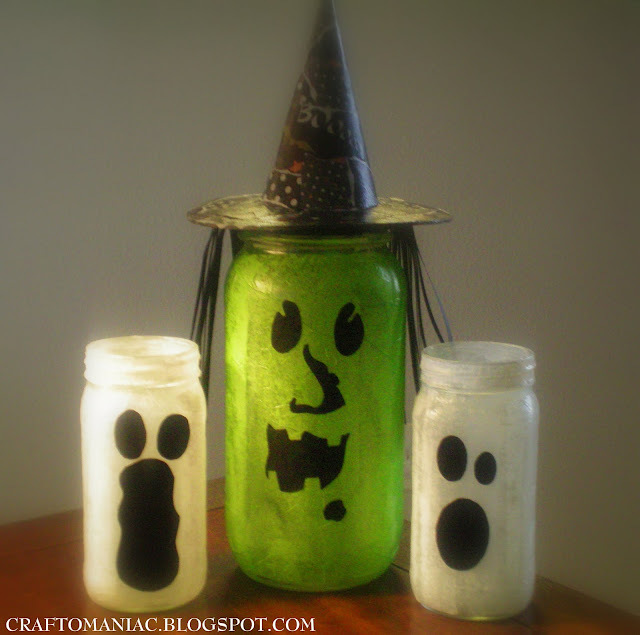 Your Witch jar is just too good for words. AND!!–FrankenSTEIN!! These are too stinking cute! I think I found an easy project for my Brownies for Halloween.. thanks! LOVE your jars. How totally cute!!! I love these!! I can’t wait to make a set, I am a new follower! SOOO cute!! I can’t wait for fall, especially Halloween! !